I fell in love with sailing reading Arthur Ransome’s “Swallows and Amazons” book series at age seven. Then reading everything the library had on the topic, summer sailing camp, and family cruising charters. No boats lost, or people seriously injured, but plenty of potential disasters, hundreds of failures, and a million problems. Each teaches a lesson. One of the early ones: I was an over-confident 18 year old and asked by the owners to step-in as the Skipper after the older, much wiser Skipper quit. After the owners insisted on a hasty start, I sailed a weak, ill-equipped boat across the English Channel. We arrived in Brittany, France with torn sails, 25′ tides, and no charts. Our “destination” was further south. The lessons were many, including: know the boats systems, take a short shake-down sail (to test the boat and crew), think through the improbable problems and prepare for all you can. Relax and enjoy it! Don’t have a schedule, even if it’s just for a day sail. This is a sport about slipping silently through the water; not about keeping a schedule. If you have to be at place X by time Y, drive a motorboat, or a car. Learn to sail on a small boat. A small boat talks back to you. When you do something the effect is immediately seen/felt/known. On a big boat everything you do is masked and dampened by the inertia of a large mass. Sailing a small boat is also instructive of the “things” you don’t need to enjoy sailing. Sailing as an industry is all about gadgets, safety, speed, convenience… things you’re supposed to “need”. Don’t forget sailing is a simple pleasure. Don’t get hung up on the lingo. The sailing vocabulary is largely arcane and enabled 200+ sailors to manage 20 or more square rigged sails on 18th Century warships made of wood. Yes, if you’re racing on someone else’s boat you need to know what they call things, but the chances are good the boat next to you has different names for at least some of those same lines. Sandy MacArthur, who took me as crew on a five month sail from Acapulco to Tahiti on the basis of two phone calls. I was 17. I did all the hottest, dirtiest jobs very happily. Al Johnson, an upper class-man at University of Washington, who I sailed with or against for several years on everything from Lasers to a 53′ ocean racer. Dave Walden, who very successfully raced Solings with me for seven years, partnered in a Tornado catamaran, and then partnered in 37′ racer/cruiser for an additional ten years. Oh, and he introduced me to wife of 30+ years. I’m a sailing addict, but after that, hiking in the mountains, skiing, and scuba diving are my enlivening pursuits. John Bell was named ASA Instructor of the year 2016. He is a mild mannered sailor with tremendous experience. He and wife Jil sail their 42 foot J-boat south each winter returning in the spring to teach sailing and enjoy summers in New England. Students love to sail a leg with them on their annual migration. 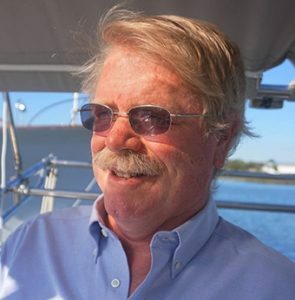 John has extensive offshore and coastal experience, and holds a 100 ton captain’s license.